VIA's KX133 chipset has definitely opened up the Athlon motherboard market to more faces than were present at the initial launch of the Athlon. While the simple fact that more motherboard manufacturers are supporting the Athlon platform now than just 6 months ago cannot be attributed to VIA's chipset alone, many were simply afraid of supporting an CPU that, at the time, wasn't a proven solution, and a combination of those two factors as well as a number of other influences severely limited the number of Athlon motherboards available on the market. A company we're very familiar with, Tyan, decided toward the end of last year that they would produce an Athlon motherboard. In order to understand their motives, you have to first understand what kind of company Tyan is. Tyan started out by manufacturing products for Sun compatible systems and naturally migrated into the workstation/server PC market. Not too long ago Tyan also decided to branch out into the desktop PC market with a line of relatively unsuccessful desktop motherboards which failed to gain the same recognition and respect that Tyan's higher end products had no problems earning. So when presented with the idea of manufacturing an Athlon motherboard, Tyan's instinctual reaction was to produce a workstation/server level motherboard for the Athlon platform. Unfortunately, due to AMD's chipset roadmap for the Athlon, it would be another year from the time Tyan wanted to produce an Athlon motherboard until AMD would actually debut the workstation/server level Athlon chipset platform that would support dual processor configurations, something Tyan really wanted to feature on their first Athlon motherboard. This is where the marketing comes into play. Tyan could either wait and not jump on the Athlon bandwagon until the end of 2000 or maybe even the beginning of 2001 with a killer workstation level Athlon motherboard, or they could release a single processor solution now based solely on a reference board design, get their foot in the door, and save the best for much later with a high end Athlon product when the time was more appropriate. This way Tyan could profit off of the current Athlon craze, while, at the same time, not sacrificing too much of their own time on a project that they didn't want to have to do. Tyan is a workstation/server level motherboard manufacturer. At that level, you have much more freedom (especially in terms of cost) than you do at the desktop level (and the profit margins are higher), so it's natural for Tyan to want to pursue the high end market that they're so good at developing for, but at the same time, it makes sense from a marketing standpoint to get your name out there among the motherboard manufacturers that do support the growing Athlon platform. The S2380 is obviously based very closely on VIA's KX133 ATX reference design, joining the ranks of EPoX's 7KXA. Tyan's reasons for going with the reference design are obvious -- it minimizes the amount of research and development time required before actually producing the board, and since it is a tried and true solution, they can't really go wrong with the design. Because of the S2380's close relationship to the reference design, we immediately expected it to give us about the same experience that we received with the EPoX board we tested not too long ago. 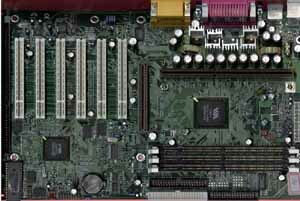 The board is an average sized ATX motherboard based on the KX133 chipset as we mentioned above and because of its reference design heritage, it very closely resembles the EPoX 7KXA that we reviewed a while back. 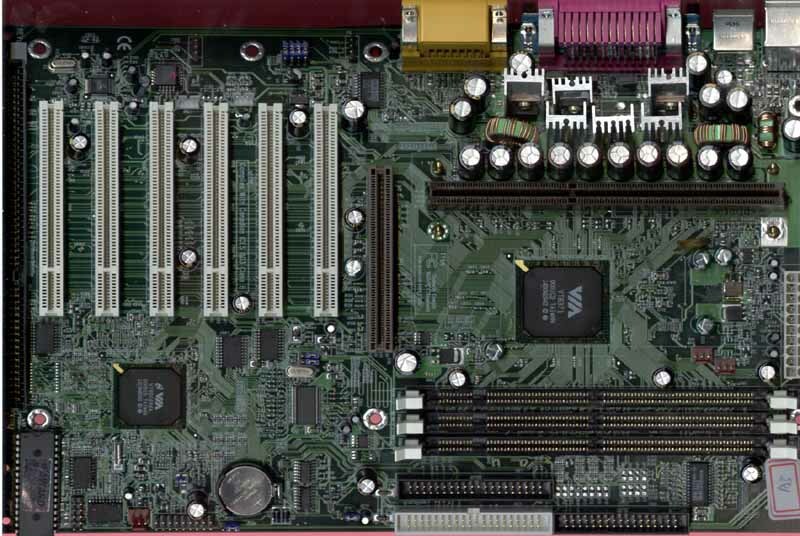 The chipset makes use of VIA's 371 North Bridge, which unusually enough was left uncovered on the Tyan board while every other motherboard manufacturer has placed a heatsink on the North Bridge of their KX133 designs. We have seen this from Tyan in the past where they have refrained from putting a heatsink on the North Bridge in order to cut costs on the board. While we did not experience any instability as a result of this removal , if you have a cooling setup such as Swiftech's MC2001 where there is no air being blown across the chipset, this may become an issue. As you've heard quite a few times from previous KX133 motherboard reviews, the 371 supplies the S2380 with its 133MHz memory bus and its AGP 4X support which are the two key advantages over the older AMD 750 chipset that the first generation of Athlon motherboards used. From a performance standpoint, the 133MHz memory bus is really the only noticeable advantage the KX133 holds over the AMD 750. The 371 North Bridge boasts support for VC100/VC133 Virtual Channel (VC) SDRAM as well as regular PC100/PC133 SDRAM. While we have managed to track down one place you can order VC133 SDRAM from (courtesy of one of our readers - http://www.ec.kingston.com/ecom/kepler/PartsInfo_Bod.asp?ktcpartno=KVR-VC133/128), at a price of $180, and considering the relative lack of a real world performance increase, we still can't justify taking advantage of the 371's support for VC-SDRAM. Just like the rest of the KX133 motherboards we've reviewed, the S2380's AWARD BIOS setup allows the manual adjustment of the FSB to SDRAM clock ratio. In the event that your memory can't run at 133MHz, the chipset allows for a 3:3 ratio to be used with the FSB frequency to let your memory bus operate at 100MHz (along with your FSB at 100MHz) while still offering PC133 memory owners the option of using a 4:3 ratio thus placing the memory bus at 133MHz while the FSB still runs at 100MHz.